Unlike author; One’s previous work: One Punch Man, which was more parody than anything, Mob Psycho 100 is a much more introspective look into the mind of a person with immense power, but no real desire to use it. In pursuit of this, the series is split into two, very distinctly different halves. The first of which is a quieter, more character focused set of stories. There is still a ton of esper wackiness, but the action all felt low stakes (not in a bad way), and the parts of the story we were invested in were the personal trials the characters themselves were going through. When reviewing these episodes on an individual basis, I’d spend some portion of the show gushing about how much I admired the character of Mob, who is essentially an emotionally stunted social pariah. Despite possessing incredible power, which could give him anything he wanted, he consistently refuses to use them as a crunch in his life, despite how much he struggles. And his inspiring drive to better himself on the same terms as everyone else around him draws people towards him. Reign, Dimple, the body improvement club, Journalist girl, even the girl he has being crushing on from the beginning starts to notice him. He refuses to take short cuts and gains the respect and admiration along the way. I was consistently touched by the quieter character moments between Mob and Reigin, between him and the girl who pretends to habour romantic feelings towards him, and the ending between him and the dream sequence that almost has him falling into the darkest aspects of his personality. Seriously, the body improvement club are the best bunch of boys in the world. Not only are they jumping traditional stereotypes, but they’re genuinely the nicest, most supportive group of friends Mob has got, willing to risk life and limb for him, all thanks to his unwavering dedication to self improvement. Like I mentioned at the top though, through his honest effort, Mob creates bonds that help him break away from the temptation of giving into his powers and support him to become better and stronger as a result. And then the series takes a turn. Mob comes home to find his family apparently dead, its a dark twist to what had been an especially light and silly episode up until that point. This isn’t an especially dark or edgy show though and we learn that Mob’s family is fine right away in the next episode, but the result is us getting to see Mob go on a revenge rampage thoughtout the city just in time for a secret society of espers to try and take over Japan. The weirded thing happened to me after this point; I realised that I had been enjoying the show a lot more when it was prioritising being heartfelt over action packed. Without a doubt it was thrilling, with the show’s style of animation benefits these dynamic battle scenes amazingly, but it became a show less about Mob and his struggles and more about the wider cast trying to fight off the big bad before Mob eventually gets his crack at it and wins the day. I might be turning into a big old sop, but action alone doesn’t draw me in like it used to when I was a breathlessly excitable teenager. Nothing about this side of the series was bad, but it took Mob away from the front lines due to his ability to pretty much put a solid end to any situation. However, unlike Saitama in One Punch Man, Mob never wants to fight the enemies. I was on a path of ending the second series of Mob Psycho 100 on a slightly disappointed note before the final two episodes. But when Mob gets stuck in, he does everything within his power to talk the enemy down without overpowering them like Saitama always eventually does. Even when he started to enjoy the battle with the final villain, as a more typical Shonen hero would, he ends up snapping himself out of it as though it was a negative act. Mob never really seems to accept is powers, and every moment of personal compliment comes from his more mundane accomplishments. Which makes him so much more relatable when it counts. This was a real strong season for me, giving me two shows I adored to near death. Both about characters, their relationships and making me want to grab the tissues. Despite the hard turn it does at the half way point into a more action focused show, it never lost the heart is had in abundance during the first epsiodes. And with recent talk of the season series of One Punch Man being far from stellar, I’m so glad we got this gem when we did. And we’d best not have to wait years for the third series. 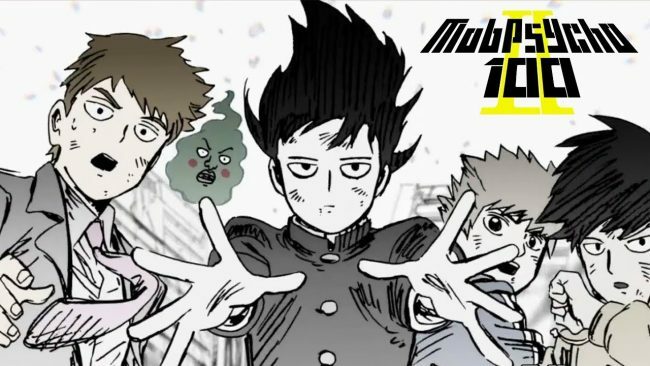 Posted on April 5, 2019 by WooderonPosted in Anime, My Thoughts on:Tagged Anime, crunchyroll, dimple, esper, mob, Mob Psycho 100, Reigen, season 2.